Why is it that some companies are loved while others merely tolerated? We live in a “word of mouse” era in which enthusiastic customers are our greatest marketing advantage. In the past, satisfied customers stayed loyal, but with so many choices, today’s customers are promiscuous. This program helps you look at your customer through a new lens: one that focuses on not just your customers’ expectations and desires, but also on their “unrecognized needs”. To discover how to fulfill needs your customers don’t even know they have. To further differentiate your organization in the marketplace. 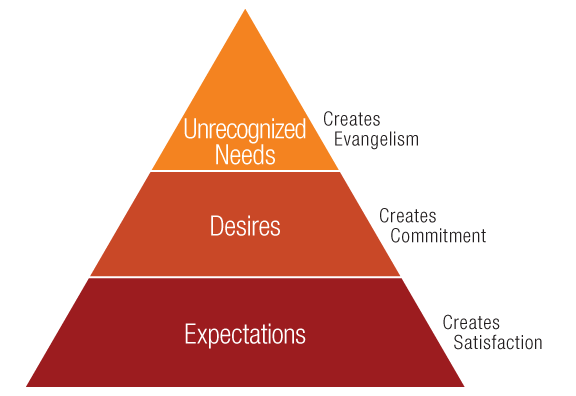 To create a Customer Hierarchy of Needs for two customer segments. To prioritize goals and plans to strengthen customer alliances. To enlist the PEAK perspective to unite your group’s efforts. This add-on service offers a comprehensive, systemic approach to creating (or strengthening) customer relationships. After the strategy session, we help navigate the challenges of implementing and sustaining customer programs and practices. Our approach is customized based on outcome of strategy session. Some times we will launch customer growth teams who will dive deep into strategy and segmentation. Other times we facilitate groups to identify and map customer touch points and specific opportunities to provide a better experience.